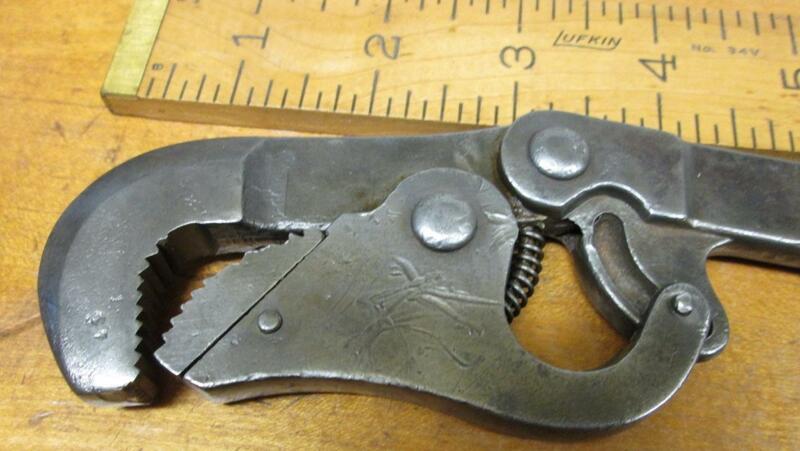 This is a hard to find automatic adjustable wrench marked "BULLARD WRENCH NO. 1 PAT. OCT. 27 03" on the handle area. This No. 1 size is 9.5" long and appears to be made to use on pipe up to 1.1" diameter exterior. It is spring loaded to the closed jaw position, but the pivot position design gives maximum leverage and gripping power. This is the smaller size, there was also larger versions of this same wrench. 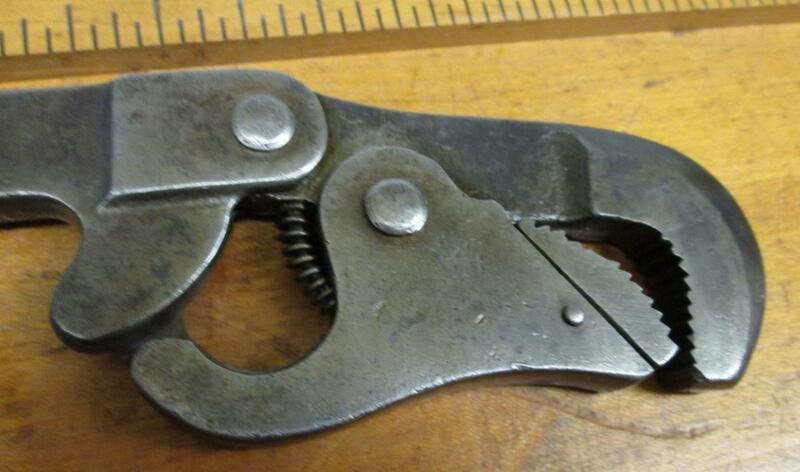 This wrench is in nice clean condition with some wear on the jaw grippers noted, otherwise very little wear. 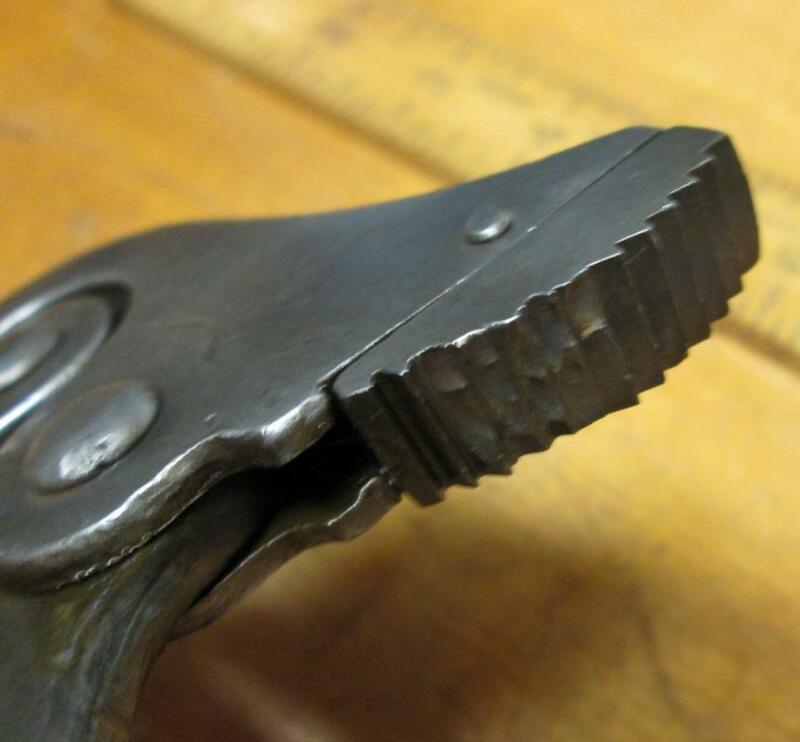 Some of the sharp points of the jaw grippers have been chipped off over the years. This is only seen on the replacable jaw, so if you were able to find a real good replacement jaw this wrench would be in fine working order. The spring and pivot are in great shape. The automatic system works very smoothly as it should. Quality made in the U.S.A.! There is no rust, cracks, or damage. We do note some dings and scratches near the main pivot pin mostly, but does not effect function. A very unique wrench, truly a hard to find collectible! Items Similar To "Bullard Automatic Pipe Wrench No. 1"